A nontraditional student is one who is a part of a nontraditional course. A nontraditional course is any career in which males or females comprise 25 percent or less of its total enrollment. For females, many non-traditional careers are: automotive technology, building construction, emergency medical services, horticulture, accounting and management, engineering and welding. While fewer non-traditional careers are available for males, these careers tend to involve cosmetology and early childhood education. The students chosen this month received a T-shirt, a certificate, a bulletin board decorated in their honor, their name on the Career Center’s marquee for a month and recognition during school announcements. 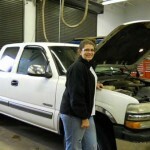 Lydia Sinclair, automotive technology student, February nontraditional student of the month. 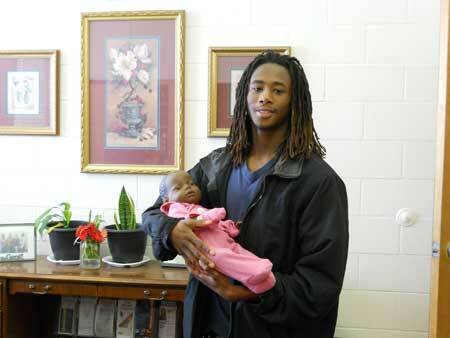 De Vasha Blacks holding baby in parenting education; March’s nontraditional student.